​I wanted to provide an update to my water filtration system. The main reason I changed my system was twofold: Higher rate flow of filtered water and ease of collecting unfiltered water. While this system works great for me, it may not be your style or too heavy at 10.4 oz. My system is actually a combination of several different ideas with the main gravity system coming from here: https://www.youtube.com/watch?v=nxi1IFmFXd0&t=21s. The same person also compares the Sawyer mini vs the Sawyer Squeeze using the same type system in this video: https://www.youtube.com/watch?v=XfK5rTWxakw for those wondering and wanting to save an ounce or two. With that being said, I use the following items in my Sawyer Gravity Fed Easy Collection Water Filtration System and include a weight breakdown of parts. For storage of the system, I use a silnylon bag I already had at home (0.55 oz). To make filling easier, I added two additional items. One was a tornado tube to connect the unfiltered water to my “scoop” such as this one (I bought mine locally – 0.4 oz): https://www.amazon.com/Toysmith-TSM4322-Cyclone-Tube-Assorted/dp/B001SAMD5Q/ref=sr_1_2?ie=UTF8&qid=1486392809&sr=8-2&keywords=tornado+tube and for the “scoop” I cut off the bottom of the cheapest/lightest bottle I could find. In my case, I used a hydrogen peroxide bottle from Dollar General (1.0 oz). Here’s how it works. 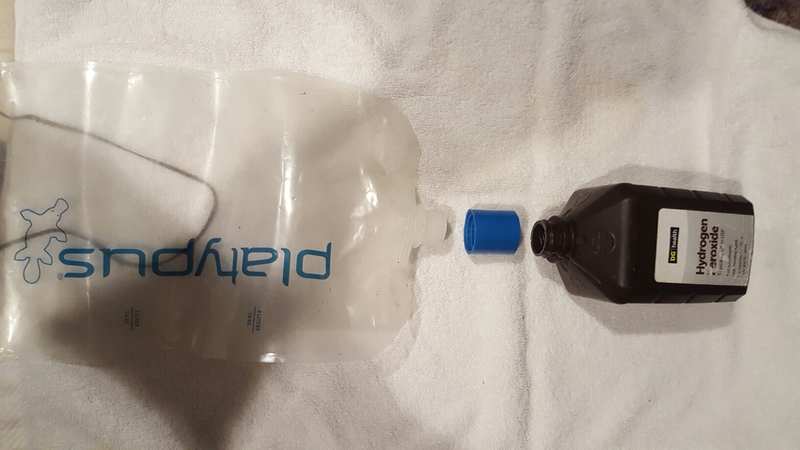 To fill the 2 liter Platy, connect one end of the tornado tube to the “scoop” and the other end to the 2 Liter Platypus Platy Bottle. FYI: I did have to modify the tornado tube a bit by cutting down the ends so the threads would engage. Scoop and fill. It’s a LOT faster and I’ll take the 1.4 oz weight penalty. 1. Remove the tornado tube and the scoop from the unfiltered water. 2. Connect the Sawyer Squeeze directly to the Platypus. 3. Attach one blue adapter to the free end of the Sawyer Squeeze. 4. Attach the plastic tubing to the end of the adapter. 6. Attach the other blue adapter to the free end of the plastic tubing. 7. Attach the clean water container (in my case the 32 oz. Sawyer pouch) and lay it on the ground. 8. Hang the Platypus from a branch a couple of feet of the ground (or hold it). 9. Watch the magic happen. I found it amazing how much faster this system was compared to squeezing which I have done for several years. It will filter the full two liters in under 2 minutes! That’s a LOT faster than squeezing! 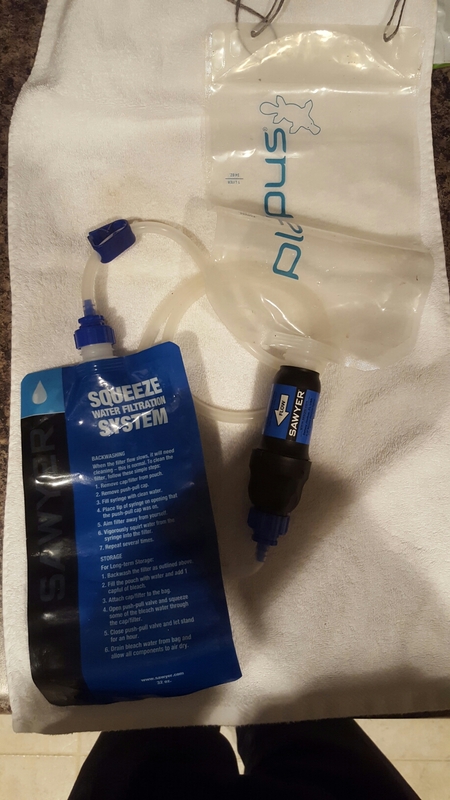 I will generally filter and fill my drinking water bottle (and 32 oz Sawyer pouch) water then refill the 2 Liter with unfiltered water before making camp. By doing so, I have 4 liters of water for eating, drinking, cleaning, and breakfast before I need water again. By carrying the sealable containers, not only do I have plenty of water for camp, but can be transport easily without spillage being a concern. The syphon hose clamp is helpful by allowing me to have water “on demand” without worrying about all of the water running out. Simply squeeze the clamp and the water flow stops. Hopefully you found this as helpful as I did!